but you may want to see the movie first before reading this review! 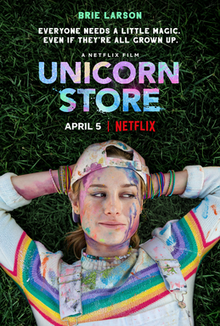 Unicorn Store is a 2017 independent movie starring and directed by Brie Larson. Kit (Brie Larson) is an art student who has failed art school and finds herself living in her parents' basement. Her childlike style with rainbow-coloured clothes and self-made beaded necklaces is out of step with everyone around her. Her parents (Joan Cusack and Bradley Whitford), despite being youth counsellors, have the effect of making her feel even worse. Depressed by this stereotypical example of failing at life, she joins a temp agency and gets a job at a marketing firm. Clearly, she doesn't belong there. One day at work she receives a mysterious and exciting invitation to visit 'The Store'. At the store, the salesperson (Samuel L. Jackson) tells her that if she can prove herself by creating the right habitat for it to live in, then she can purchase a unicorn. Kit immediately sets to work to build a stable in her backyard, with the help of hardware store clerk Virgil (Mamoudou Athie). Meanwhile, at work she's tasked with creating an advertising campaign for a vacuum cleaner, while being low-key harrassed by her boss, and putting up with hostile colleagues. The big question is -- is Kit having a mental breakdown, or do unicorns really exist? Unicorn Store is full of contrasts. The drab, monotone atmosphere of the office is the antithesis of Kit's bright, colourful art and her excitement at the prospect of owning a unicorn. Her blossoming friendship with Virgil is so different from that with her parents, who unwittingly neglect her while living for the troubled youths who attend their camp. The movie is whimsical and fun, and I loved it. I have to admit, I saw a lot of myself in Kit -- whose creativity is rejected and is searching for meaning in life. I was clutching at my blanket in anticipation of how it would end, but thankfully it was satisfying. Unicorn Store teaches us that we should be ourselves, and we'll find a place to fit in if we follow our hearts. Would I watch it again? Yes, several times! March was still quite hot at the beginning, but Autumn finally started to kick in towards the end. I've been waiting for the leaves to turn, and they finally have. It's been cool enough to start using the oven again, and cook some hearty meals. Here is my harvest. I planted 4 full-size potatoes, and put together I'd say these babies equal about the same. All it cost me was half a bag of compost and a couple of handfuls of straw. I didn't pay enough attention to regularly adding more compost and letting the plants grow taller (and therefore grow more spuds underground). I'll remember that for next year. I had some Bertie Bott's Every Flavour Beans from a trip to the Shop of Requirement (see my post on my first visit there here! ), and it was time to try them! Yes, they really are every flavour! I wrote about them a bit more on my Instagram. I love re-potting plants. It's one of my favourite activities. I went to the local nursery and splashed out on lots and lots of pots, and a couple of new plant friends. Then I had some mammoth re-potting sessions. I'm still not done yet though. I had a wealth of cuttings from my fuchsia and succulents to pot up, and I'm still not done yet. I've been trying to re-use materials more -- such as bits from a disposable coffee cup to line the bottom of the pots. I started a new craft project but I can't reveal anything about it yet as it's a gift for a friend. So you'll have to wait until next month to find out what it is! To my pleasant surprise, I found that there's been a resurgence in the popularity of podcasts in the last few years. Some of my old favourites were on Stitcher, and I discovered many more podcasts that I love. More than I could ever possibly have time to listen to! Skip to the end for two BONUS podcasts that I just had to include, and have a look at my other blog for Eight Great Spiritual Podcasts. I might have to do a second list soon because there are just so many! A podcast for all people and all bodies. April and Sophie chat about all things body positivity, self-love, issues that fat people and allies face, tips and advice, and their favourite music, TV shows and Instagrams. While some of the topics are pretty intense and potentially triggering, their policy of "chill vibes only" helps to keep the chat light and fun. After 3 seasons, I feel like I'm listening to friends, and that I'm part of the "fatmily". Conner interviews counter-cultural figures on such topics as culture, politics, patriarchy, body positivity, spirituality, creativity, the occult and more. Many of the topics are ones that I hadn't thought much about previously, and I always come away wiser than I was before. Plus, Conner is so inclusive and friendly, and seems like a real sweetie. Hosted by Harry Shearer of The Simpsons fame, Le Show has been running weekly for 35 years in various formats. He focuses his acerbic wit on such topics as current news, politics, and the environment. My favourite segment is Apologies of the Week. There are occasional interviews, but most of the shows are hosted by Harry on his own, with satirical skits and songs. It's just about the only way that I keep up with current events now that I can't bear to watch the news anymore. Simon and Martina, a Canadian foodie couple living in Japan, are already well-known for their YouTube videos on life in Japan. Their podcast delves deeper into their lives with small observations, funny stories, tips and advice. It also looks at Martina's chronic illness and her strategies for getting through life as happily as she can. This is an audio-visual podcast on YouTube. UPDATE: This podcast is has been made unavailable in Australia due to currently occurring trial. It will be made available again as soon as practicable after the trial is over. There are many, many true crime podcasts, but this was one of the most compelling for me. It covers a crime committed in Sydney 35 years ago -- the disappearance and probable murder of Lyn Dawson. Her husband was a famous rugby player and school teacher, and she had 2 small children. When she disappeared, everyone believed her husband's story. The crime is being investigated by Hedley Thompson, a journalist for the Australian. As the first few episodes of the podcast came out, witnesses approached him to add new information to the case. This led to the police investigation being re-opened. It is essential to listen to this podcast chronologically from the beginning. Out of the (again) many, many writing podcasts out there, I've chosen Manuscripting because I think it deserves more love. A podcast doesn't have to be professionally produced (or have ads in it!) to be worthwhile. The episodes are quite short and feature Leslie just talking about her experiences and tips with writing. Leslie is also an artist and pen nerd, so those topics sometimes creep in too. It's an audio-only podcast on YouTube. There are hundreds of history podcasts to choose from, from the BBC through to the Stuff You Should Know stable of offerings, but I chose The History of Vikings because it's independently produced, and has varied and interesting guests. Topics range from the broad to the everyday, such as food or music, and guests include scientists, historians and re-enactors. Okay, here's another history podcast! Again, it's independently produced, and well-researched with a splash of humour. Many original texts as well as scholarly sources are referred to. It covers the witch trials of the 16th century, as well as the cultural history of and attitudes to witchcraft in ancient Greece, Persia and other topics. Another history podcast, Dead and Buried focuses on historical crimes in Melbourne. As a Melbournian history nerd, it's right up my alley! I came across it by accident a few weeks ago, and have been bingeing on it ever since. The hosts work at the Public Record Office, and use its resources to come up with stories that have comprehensive historical context and are also interesting and varied. There are murders, but there are also love affairs, ghosts, riots, and activities that are no longer crimes today, such as cross-dressing. The website has supporting material with some wonderful period photos and illustrations. I know it's a niche podcast, but I'd really like to see it get more love! 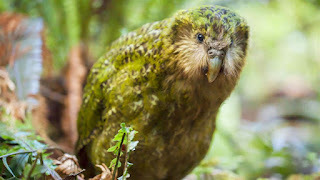 Kākāpō are a flightless parrot native to New Zealand. They are adorable and also critically endangered -- there are less than 150 left in the world. There is however, a dedicated breeding programme and fans around the world focused on their recovery. I only discovered this podcast a few days ago and haven't listened to a full episode yet, but I'm including it on the list because the kākāpō is my favourite animal! TIP: you need to put the accents above the vowels when searching in Stitcher (and presumably other apps) to find the podcast. Once again, my favourite time of year has come around. The searing heat of Summer is dying down, and the light is becoming hazy and golden. Summer seems like almost a second hibernation period here in Australia. Plants don't grow very much due to the lack of water and the heat, and even with regular watering, several of my plants died. Now, the world is starting to come to life again. 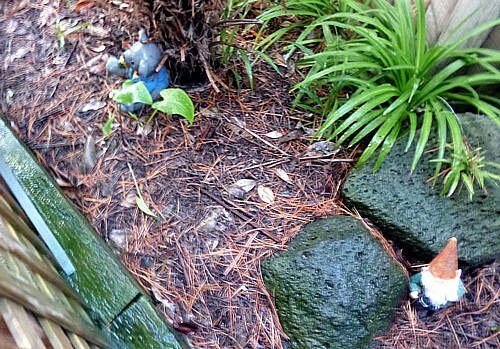 The grass is starting to grow green and lush, and the plants are daring to put out new shoots. I'm coming out of hibernation too. I've felt sluggish the last few months, hiding inside in the air conditioning, only going out as necessary to water the poor plants. I'm eager now to get back outside for the enjoyment of it. I want to go for walks, dig around in the garden, pick the last of the roses. I've been drinking Yerba Mate tea every day for my health, but as the weather gets cooler, I want to drink a lot more! I've decided to collect teapots, tins and other tea accessories, and I'm in the process of setting up a display and storage area for them. It's time for the yearly re-organisation of my tea cupboard, too. There's nothing more wonderful than hearing rain on the roof and smelling it soak into the earth. I can almost feel the plants and trees sighing in relief when the first good rainstorm of Autumn comes. Scarves, shawls and pashminas are wonderful for adding a bit of extra warmth, and giving outfits more of a layered look without committing to a full garment. There's an almost infinite choice of colours, patterns, textures and styles -- and they're easy to DIY! See this post for the making of this scarf. 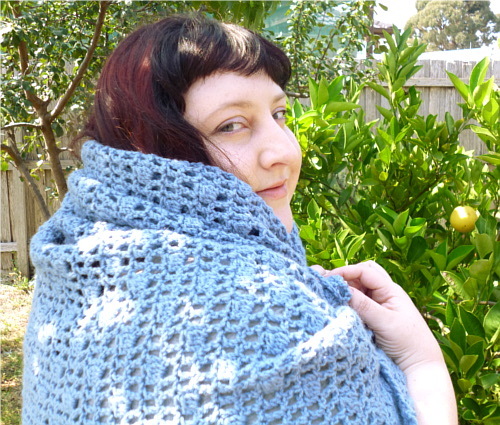 Technically a shawl. Never mind that, though. I've been itching to start using the oven again! Not only to make baked goods, but for hotpots and stews. Husband and I learned how to make baked potatoes in the slow cooker last year and they're delicious. 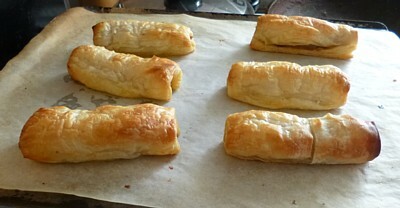 And of course there's my favourite: sausage rolls! Here is Part 2 of my Tips for KonMari De-Cluttering series. See here for Part 1! ＊ do I want a better version of this? I love books. In fact, I'd categorise myself as a book collector. When I was younger, I bought many of the classics in cheap editions just so I could tick them off the 'read' list. I kept most of them out of habit, thinking I would read them again one day. Over time, I began to realise that these books, the stories that were special to me, deserved better. Now, once I've finished reading a cheap edition, I donate it, and if I want to re-read it and keep it forever, then I buy a hardback edition. Perhaps even one with illustrations or gold lettering. As much as I love books and want to have ALL the books, in this age of digital replications and ease of access, sometimes it's about quality, not quantity. ＊ would I buy this? I've found this question useful in many situations when I was agonising about whether to keep something or not. Ask yourself: if I was standing in a shop right now and I saw this item for sale, would I buy it? I found this especially useful for gifts that people have given me. It gave me a sense of clarity. Instead of thinking about the person who gave it to me and being distracted by guilt, it helps me to think about my own personal tastes and how I feel towards the item itself. ＊ I just don't like it! Many of the things we own are there for practical reasons -- things we have to live with whether we like it or not. Cleaning products, tools, and financial papers fall under this category. 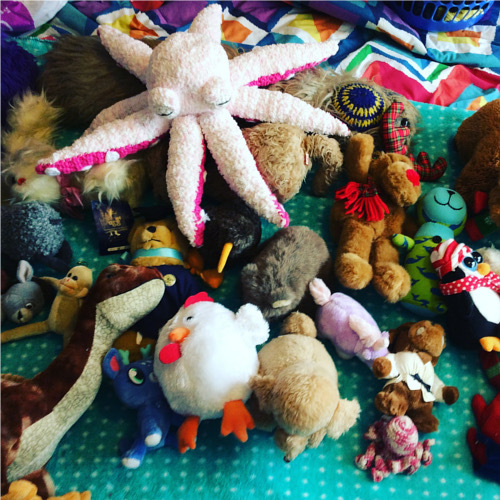 If these things don't spark joy, but we can't discard them, then how can we move forward with the KonMari process? Marie Kondo addressed this question in a talk a couple of years ago. She said that if something doesn't spark joy initially, think about what it does for you or what it will lead to for you. For example, cleaning products make your house cleaner and more pleasant to live in. The student who asked this question during the talk hated her textbooks, but Marie reminded her to think about what her studies will lead to in the future. In some cases, you can discard things if there's an alternative way of accessing it. This is especially relevant to books, papers and information. I asked myself: "Can I access my archived electricity bills online?" "If I ever want to re-read this book, is it on Open Library?" "Do I just want the pictures from this magazine?" "Will I ever have time to read this newspaper or can I access the same articles on their website?" ＊ it's joyful but not useful! I found that I had many items I loved, but I didn't have any use for them. I didn't want to part with them just because of that, so I tried to find ways to re-purpose, re-use or re-make them. I used a vase for growing sweet potatoes. I glued ephemera such as ticket stubs and brochures into my art diary. I used a leaky mug as a pencil cup. A biscuit tin I was given for Christmas now holds knitting supplies. I'm sure there are endless ways of re-purposing items. This is more clearing up a misconception than an actual tip. The KonMari method is not minimalist! I think many people have this idea because the 'after' photos of homes tend to have a lot less stuff in them than the 'before' photos. (Well, a lot less visible stuff, anyway!) But nowhere does the method say you should throw away X amount of items or keep X amount. Marie merely says that you should keep all of the items that spark joy -- no matter how many or how few. This differs from person to person, and she acknowledges that. So if you were worried that the method involves throwing away things you really want to keep, it doesn't! It's all about what makes you happy, not how many/few things you have. I'll leave you with a couple of photos of my shed. We're slowly re-organising it to become the storage hub of our dreams. Perhaps I'll write a shed makeover post one day! Now that the world has gone crazy again for Marie Kondo's KonMari tidying method, thanks to her recent Netflix TV series, I thought I'd share some insights from my own KonMari 'journey'. To be fair, I'm only about three-quarters of the way through my KonMari process, but I've done all the major categories and have discovered some things that have definitely helped me along the way. Perhaps they'll help you, too. I actually had so many tips that I've decided to split this post into two parts. You might also like to have a look at my other posts: 8 Reasons Why I like the KonMari Method and more tips in Re-Starting My KonMari Quest. Laying out everything you own and sorting it takes a lot of time. I consistently found that sorting and discarding took a lot longer than I thought it would. Sorting my beauty and bath products alone took me a whole afternoon! With the more emotionally-charged items, I find I have to stop and take a break during the discarding process to avoid feeling overwhelmed. I found that I really hated leaving a category undone at the end of a day. Not only is it messy, but there was a huge sense of something unfinished looming over my head. Don't forget, you will also need to store the items that you've decided to keep. Finding the best way to store your items (finding a place in the house, obtaining boxes or baskets to keep them in) takes time as well. The next point should help with this! The categories that Marie specifies are extremely broad. In fact, there are only five: clothes, books, papers, komono (miscellaneous) and sentimental items. Break them down into subcategories. And then break them down again if you need to! 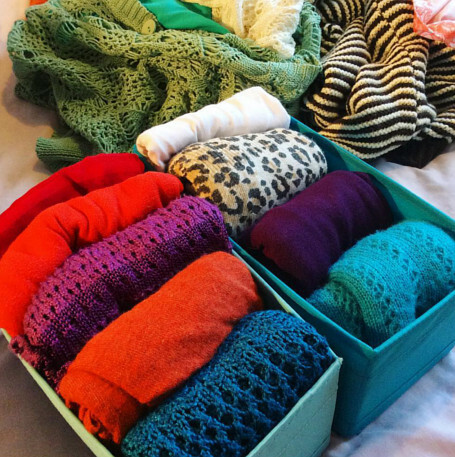 At first I divided my clothes into tops, pants, skirts, etc. Then I found that I had over 100 tops alone and nearly had a mental breakdown! So I divided the tops into long sleeve, short sleeve and tank tops. I find that I tend to wear them in different circumstances, e.g. long sleeve tops only in Winter, tank tops only under overshirts, etc. Thinking about each of these types of tops separately was a huge help in deciding which ones I liked the most. Remember, you don't have to work on or finish all of these sub-categories in one day. Depending on what you have, you may need to create your own categories, too. As an artist and crafter, I had a whole set of categories devoted to those supplies: paint, brushes, yarns, knitting needles, crochet hooks, etc. Some other categories I have that other people might not need are: bonsai pots, fridge magnets, washi tapes and tea tins. When I first began tidying, I created a 'donation' pile and a 'keep' pile (and sometimes a 'bin' pile depending on the category). After I finished sorting, I would then put the items into bags. However, I found that touching the items again made me second-guess my decisions and hesitate. To avoid this, I started setting up bags for each pile before I began. I put any discarded items in the bag straight away. I didn't have to see or touch the items again before taking them to the donation bin, and it make the whole process faster and less emotionally taxing. Don't be afraid to go through a category more than once. In fact, you may find that you'll have to, as more of that item will keep cropping up. The very first thing that I KonMari'ed was my socks. As I kept going through the rest of my stuff though, I kept finding more socks! Husband and I had used clothes and socks as packing material when we moved house. So as I unpacked boxes, more and more socks kept turning up. I ended up KonMari'ing my socks three times, and re-doing their storage twice. 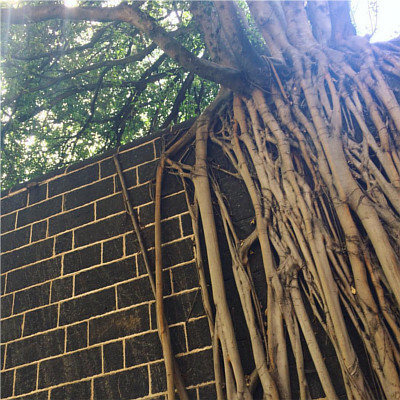 It's worth the effort to make sure your home is exactly the way you want it. February was a month of contrasts for me. I got a job halfway through the month, so I left behind much of the time I had for doing arts and crafts. Weather-wise, it's been much hotter than normal for this time of year. Usually there are only a few days above 35oC (95oF) by the time we get to February, but this year there have been many. I'm looking forward to Autumn more than ever this year! Work has been continuing apace on my art project, a crocheted blanket. I put off measuring it for a long time because I was worried it wasn't as big as I'd like it to be at this stage. I finally did measure it though: it's 180cm wide and 130cm long. At the moment it's a bit of an odd shape. Ideally I'd like it to be at least 180-200cm long, but that depends on how much time and energy I have to work on it before the due date. I was in too much of a hurry to get proper photos of the whole blanket, sorry about that. It's hard to take photos of something so big without a ladder! Like nearly everyone else (it seems! ), I've been influenced by Marie Kondo's Netflix TV series and have renewed my KonMari de-cluttering journey. 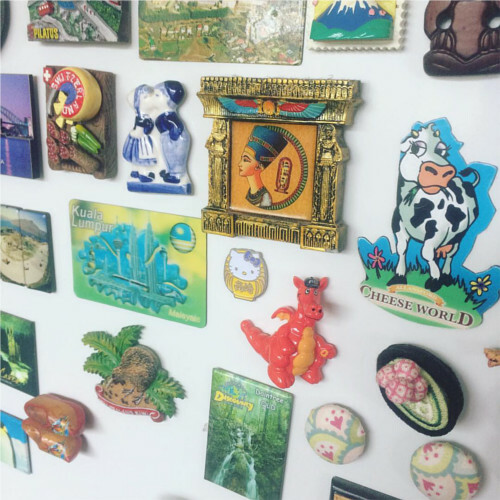 I decided to KonMari my fridge magnets. Husband and I have quite a large collection, most of which were stuffed into a bag when we moved house and never unpacked. We always buy at least one magnet when we travel and sometimes to art exhibitions, and a few friends have given some to us, too. It brought back some lovely memories. I'd forgotten I had so many pretty magnets. 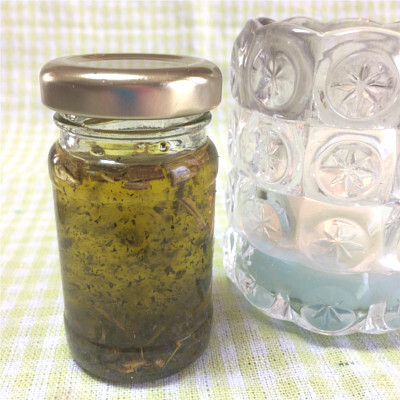 I made my first spiritual oil this month. I'm leaving it to blend for a month, so I won't know how it went for another few weeks. See this post on my other blog for more about it. I made a stir fry earlier in the month and realised that it was perfect for Lunar New Year. Pork for the Year of the Pig, long noodles for longevity, plus the noodles are golden for prosperity. The photo wasn't pretty enough for Instagram, so I've put it here. Though now I come to think of it, I was the one who first started the #allfoodisinstaworthyfood hashtag, so perhaps that's a little hypocritical of me! For some reason Sharick has decided to make the towels shelf in the bathroom his new hidey hole. It's very cute, but all the towels will need to be re-washed at some point.